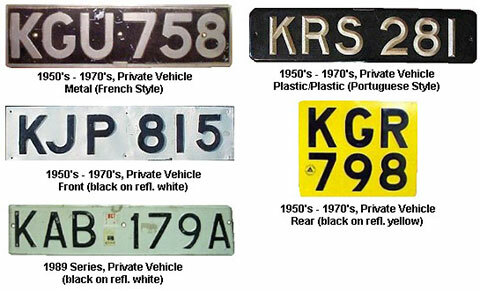 The Kenyan motor industry is set to change significantly if the Kenya Revenue Authority (KRA), which is responsible for issuing motor vehicle number plates through its Road Transport Department (RTD), adopts proposals to introduce a new third generation motor vehicle number plate series. The first motor vehicle registration in Kenya was issued in 1938. The current second generation number plate system was adopted in 1989 and going by current registration rates the final KAZ999Z number will be issued before the end of the year. The KRA is presently estimated to be issuing about 400 number plates per day. Going by the current system, the next series will start from KBA001A and end at KBZ999Z. How boring! Most people interviewed in Mombasa where most imports are licenced from, are of the opinion that Kenya needs to discard the present series describing them as ‘old-fashioned, colonial and outdated’. Most Kenyans feel that that the country needs to adopt a modern number plate registration series and system in conformity with regional and international standards. However, government is said to be considering a radical change in motor vehicle registration and number plate numbering. Local businessmen who have been importing used cars (mitumbas) in large numbers from Japan, UAE, Singapore and from the United Kingdom are anxiously awaiting word from KRA so that they can ‘confirm bookings’ of golden numbers, eg triple numbers, which are popular with their clients and are about the only way to obtain custom made number plates in Kenya. The KRA charges an extra fee for advance booking of golden numbers. In issuing a new generation number plate, the government will be looking to widen the tax base without necessarily increasing tax burden of the citizens. More importantly, the government will also be keen to integrate additional security features on the number plates so as to reduce incidences of carjacking, illegal number plate manufacture by jua kali artisans and improve management of traffic offences. Perhaps the manufacture of motor vehicle number plates may need to be outsourced through international tendering from qualified manufacturers. Current number plates are said to be manufactured at the Kenya Prison Industries who lack the advanced technology required to produce modern number plates. How much is it to register for a custom made number plate? Like someone’s name? can i registered a car with my name on the number plate. how much does it cost to have my name or a word on my plate? our vehicle registration system need to be reviewed and a modern form of registration be adopted. lost time and felt so enraged that if you had an ax.